This Tuesday’s city council meeting includes an interesting proposal, the city would like to hire self-described “Traffic and Civil Engineering” firm Hartzog & Crabill Inc. for a couple art projects around the city. The proposal spends $17700 of the city’s Art in Public Places fund for two projects, both of which say something about the our city’s current relationship with the arts. You can read about the proposal here at the Downey Patriot. A mural depicting the glory days of The Avenue Theatre is interesting. It dresses up what is currently an open wound in downtown Downey. It also makes a statement and makes you think. 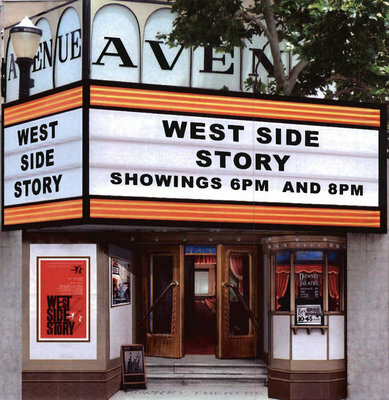 The city recognizes the theatre’s rich history and that many of its citizens have been clamoring to “Save the Avenue,” but it also maintains that there is nothing the city can do to save it, beyond wishful thinking. Excuses abound: the property was purchased with housing funds, so it has to be housing or we have to pay it back. It’s also been stated that if a wealthy individual sweeps in with millions of dollars to restore the property and millions more to operate it, that they would certainly entertain the idea. The bottom line of it is this: for downtown Downey to ever become anything significant, it needs to have the arts at the center of it. The downtown strip on Downey Avenue needs an anchor to bring the pieces together, and the mortuary just isn’t cutting it. We need a venue, preferably a smaller size than the civic theatre a few blocks away. Something designed to be affordable for local artists to take risks on. Music, comedy, plays, independent films. There are options here: a community arts space with artists lofts built on top (“housing”). A proposal can be drawn up, and a developer searched for. The site can be marketed as an arts opportunity– set aside the pretty Tierra Luna proposal and consultants, and draw up something for this. The city could form an arts commission to figure out how to position the property among developers and arts organizations. This mural makes a statement, albeit an ironic one: We know The Avenue is shuttered and falling apart, so we’ll put up the money to paint over it with a facade depicting a day when it was vibrant and alive. That will tide us over until the city finally develops its plan to tear down the building and eliminate all traces of it. 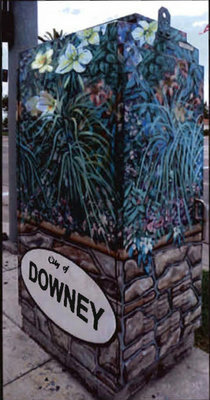 The second attempted public art project is that we’ll hire the same firm to paint seven utility boxes around the city. How were the designs for these boxes arrived at? Did they give a well-known, interesting, respected artist a chance to express themselves and come up with something compelling to paint? Or how about offering these small projects up to city residents or art students to propose an idea and execute it with financial support from the public art fund? Maybe an engaging community art contest? These might be processes I could get behind, and painting utility boxes could be a compelling low-cost project. However, I’m guessing what probably happened was a quick brain-storming meeting among city officials and design consultants that landed on these pretty decorative designs. This is not an artistic process, even though a skilled painter is executing it. This kind of thing should be categorized as craft, or worse: decoration. Certainly not worthy of a serious Public Arts program. 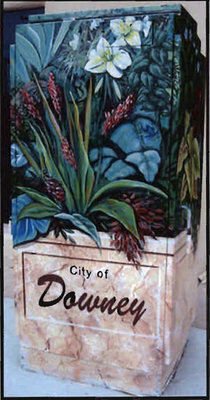 There’s even a gaudy sign on the bottom of some of these that says “City of Downey,” a clear indication of it’s intended purpose. I will applaud one thing, however. 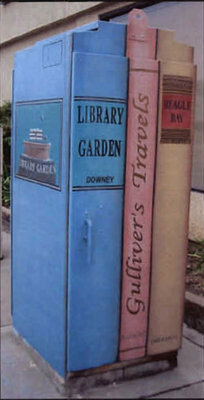 The revisions to the policy manual defining Downey’s Art In Public Places program are a step in the right direction, for now setting aside the dissolution of the AIPP committee. Moving the program under the auspices of Community Development (instead of Community Services) is the right fit. Taking away restrictions as to only allowing sculptures is a good thing. I’m not so sure about loosening the requirements for fountains, however… and the removal of a requirement that it can’t be near a utility box. It’s often said that art is defined by its context. I’ll add to that that art is defined by the context of the process that it was created. Involve the community. Make an organized effort to invite artists to take risks and propose something bold. Councilman Mario Guerra says that he’s asked the local artists to “step up.” The Downey Arts Coalition is an attempt to do that– it’s a lot of work, but I think we can put together some interesting things for our city. Join us at the next meeting if you can. Update: The contract was approved, and there has been some public back and forth. An updated article in the Downey Patriot recaps it… though out of context my quote sure seems extra snarky. I don’t intend to be someone speaking out against things, but to find a positive initiative to speak out for. Guerra and Brossmer have offered other utility boxes to be used for local artists, if a plan can be worked out. i agree with what has been written. I was told about this idea months ago and at that time expressed my idea of letting local artists, especiLly those from our local high schools, show what they are all about. There of course would be recommendations from the art teachers, and guidelines with some approval, and I was told that that would be a good idea. The murals were to be about $4k each and the heater boxes @ $2k… For a city that is trying to break into being a city of the future we are still in the past. Having lived here all my life and hearing the complaints from my parents, things are still the same. You have people who cannot move on, or are not willing to. And there are those who want all the control…PLEASE don’t let Downey remain in the dark ages… Let us “grow up”!! So, when will this community arts space make its way into Downey?? We all know Downtown Downey is dead, it’s time to do something about it. 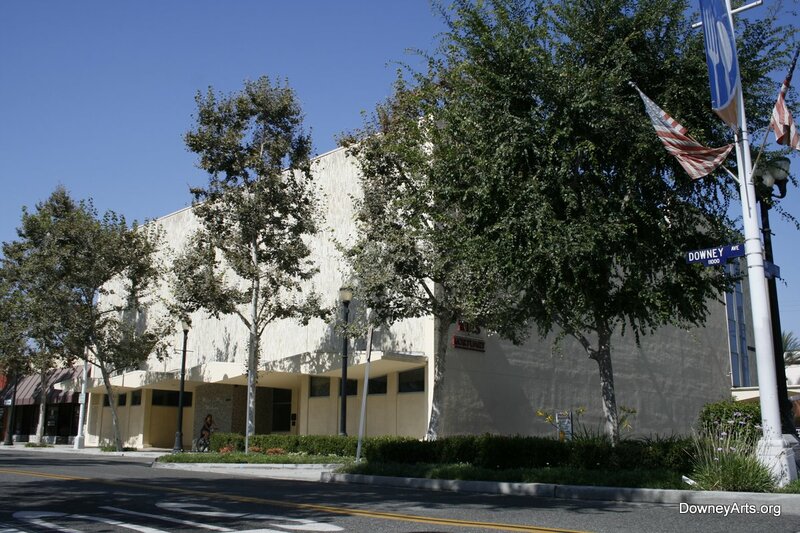 Art changes everything, so let’s make it happen, Downey! !